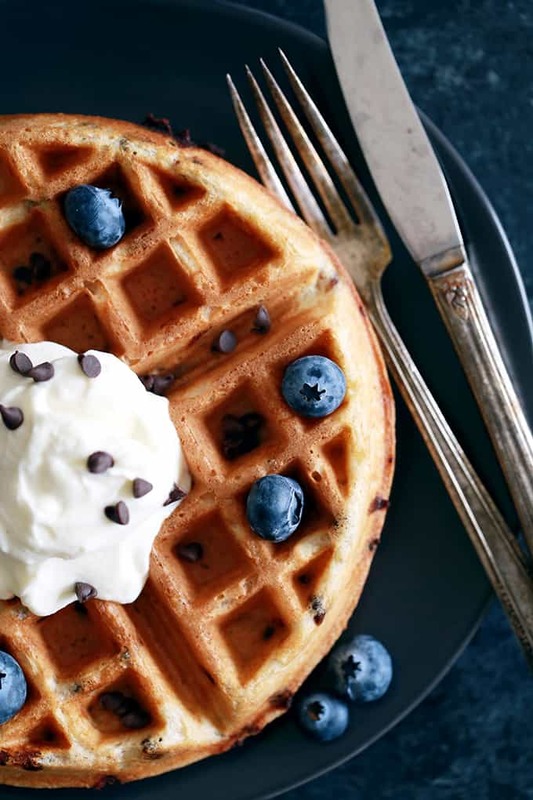 These Chocolate Chip Yogurt Waffles take just 10 minutes to prepare which means breakfast is on the table in no time! 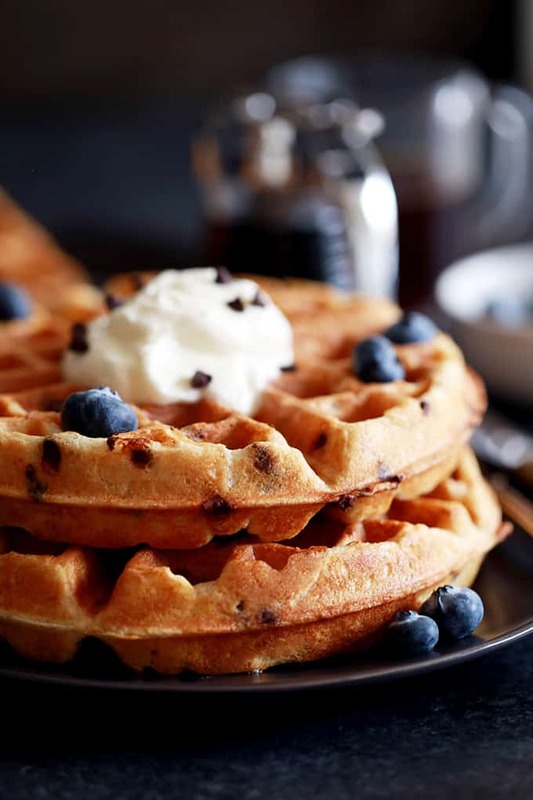 Studded with mini chocolate chips, these waffles get their signature flavor from plain whole milk yogurt and butter which helps to achieve their crisp exterior and light and fluffy interior. It’s Thursday – bring on the weekend, I say! After another round of sickness at our house, I’m ready to do a whole lot of absolutely nothing. Our second oldest started the week off with impetigo and then strep and this mama is absolutely tired of playing nurse. Again. It seems like that’s all I’ve done for the past two months and I’m pretty much over it. And the sick kid? Well, tomorrow happens to be her seventh birthday so let’s hope she’s at school all day today and on the road to recovery so that she can celebrate. And what has our little carb queen decided to have for her birthday dinner? None other than a waffle bar featuring these Chocolate Chip Yogurt Waffles. I’m only happy to oblige as I can’t think of a better way to celebrate. 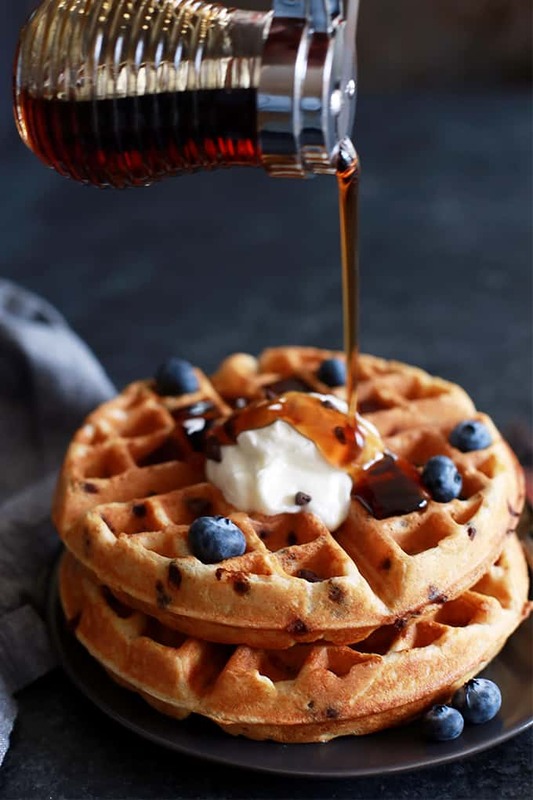 These Chocolate Chip Yogurt Waffles are a jazzed up version of the Yogurt Waffles I’ve shared with you before. I’d guess we enjoy them at least every other weekend as they truly are that good. It’s hard not to fall head over heels in love with waffles that are perfectly crisp on the outside but yet light and fluffy on the insides. And then, of course, when you provide bowls and bowls of various toppings for a waffle bar so that you can fully customize your creation? It’s pretty much the best thing every and earns me a big mama gold star each and every time it happens. 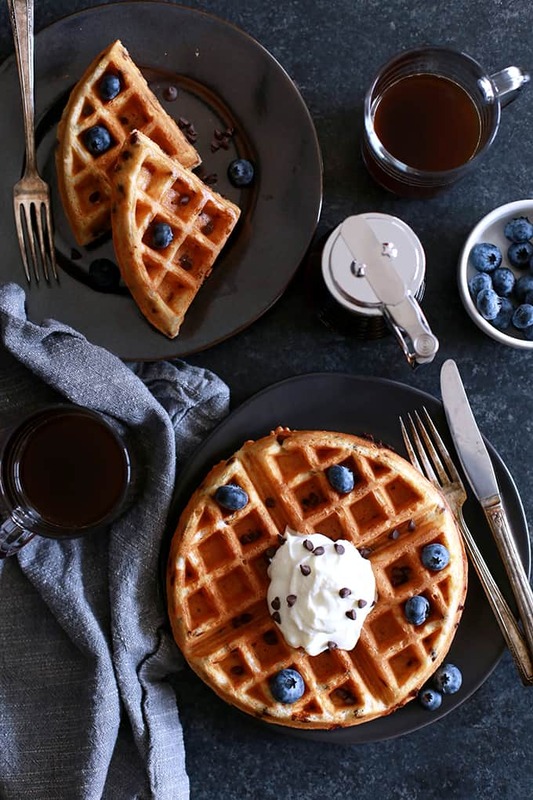 These Chocolate Chip Yogurt Waffles take just 10 minutes to prepare which means breakfast is on the table in no time! 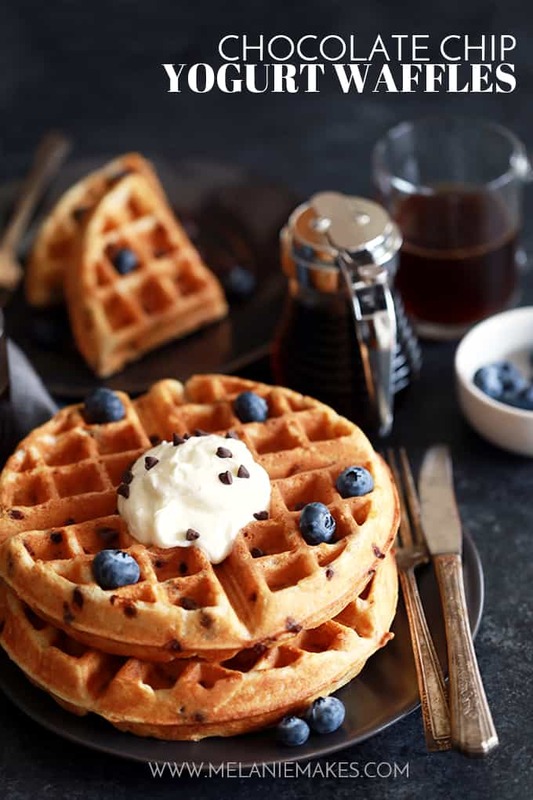 Studded with mini chocolate chips, these waffles get their signature flavor from plain whole milk yogurt and butter which helps to achieve their crisp exterior and light and fluffy interior. Pair them with my Oven Roasted Bacon or Slow Candied Bacon for the ultimate breakfast or brunch spread! Here’s to seventh birthdays and your day being made because you get to have Chocolate Chip Yogurt Waffles for dinner. May we all take such pleasure in the little – and delicious! – things that life has to offer. Pile them high with your favorite toppings and simply enjoy. SIDE NOTE: If you’re looking for an awesome waffle iron, I can’t tell you how much I love my double Belgian waffle maker. Not only is it non-stick which makes clean-up a breeze, but it also makes cooking waffles for our family of six so much quicker as I can make two at a time. I also love that it alerts you when your waffle has reached your desired doneness. No more constantly open and shutting the waffle iron to make sure your waffles are done to your liking! In the bowl of an electric mixer, add flours, sugar, baking powder and salt. Mix on low to combine. Add melted melted butter, milk, yogurt and eggs. Mix on low until just combined, being careful not to overmix. If necessary, spray waffle iron with non-stick spray. Ladle approximately 1/2 cup batter onto waffle iron and close. Cook until waffle is golden brown, according to manufacturer's instructions. Serve with maple syrup, additional yogurt, fresh berries and granola or muesli. Looking for other ideas to add to your next waffle bar? 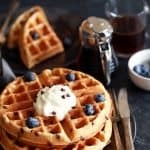 Check out these decadent Blueberry Cake Waffles, this savory Cheddar Bacon Cornbread Waffles recipe or these dangerously delicious Brownie Waffles. These waffles look and sound so good! I have to make them for the boys! Oh, I love this! Such a perfect breakfast idea! These would make the perfect addition to our brunch spread this weekend! Who doesn't love chocolate chips?! These are perfect day starter! I wish I could have some for breakfast! Oh my this looks like such a tasty treat!! I've had this bookmarked since the day you posted this recipe. 9 inches of snow and falling here in New Hampshire has us trapped inside but with full Bella's after finally making these.And I used our homemade yogurt ! You're so kind, Tami - thank you! Thank you so much for taking the time out of your day to let me know you enjoyed them, so appreciate it! Thanks so much, Amber! We just had them again this past weekend - hope you'll let me know what you think! I don't know who would be more excited about this breakfast...my toddlers, my husband or me since they take 10 minutes. These look beautiful! And PS I feel ya on being over the whole nurse thing lately!! You're so sweet, Lauren - thank you! Here's hoping both of our crews are feeling 100% ASAP! We went through the whole sickness thing this winter too, so I can relate. Glad your little one is feeling better, and this is a delicious way to celebrate! Love that you added in extra protein in the yogurt. The chocolate doesn't hurt either! I always think to do chocolate chip pancakes but love the idea of doing waffles! They look wonderful! You'll love the texture of these waffles, Valerie! Chocolate chip pancakes have been a mainstay in my household for years, but we've never made 'em into waffles. Clearly, I need to change this. Immediately! You definitely need to make the switch, Erin! My day would automatically be better by having these for breakfast, lunch or dinner! Birthday or not! !